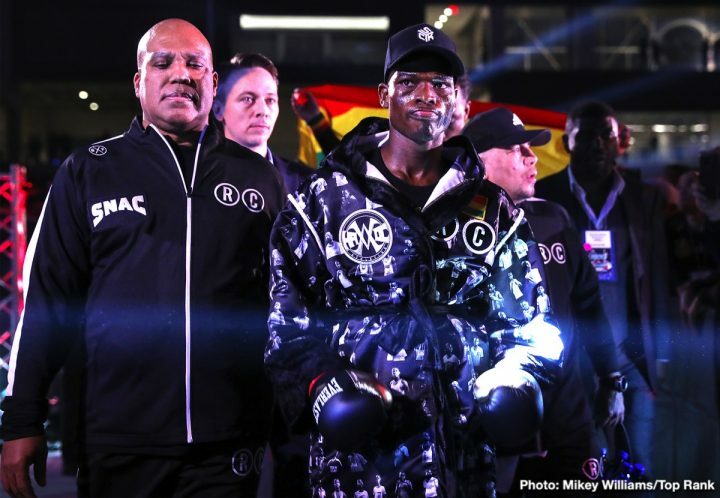 By Chris Williams: IBF lightweight champion Richard Commey (28-2, 25 KOs) has recovered from his hand injury, which delayed his unification fight against WBA/WBO champion Vasyl Lomachenko, and he plans on returning to the ring in June or July to make a defense of his IBF strap. Commey, 32, picked up the vacant International Boxing Federation lightweight title earlier this year in stopping the hapless Isa Chaniev by s second round knockout on February 2 on the Sergey Kovalev vs. Eleider Alvarez card in Frisco, Texas. The plan at the time was for Commey to immediately face Top Rank fighter Lomachenko in a unification fight, but unfortunately Commey suffered a knuckle injury in beating Chaniev. Now two months later, the injury has healed, and Commey has been cleared to start training for his next title defense. Lomachenko (12-1, 9 KOs) will be defending his WBA/WBO titles against his World Boxing Association mandatory challenger Anthony Crolla (34-6-3, 13 KOs) on a Top Rank Boxing card on April 12 on ESPN+ at the Staples Center in Los Angeles, California. Lou DiBella, the promoter for Commey, says he’ll be defending his IBF 135 lb belt in June or July, and then facing the winner of the Lomachenko vs. Crolla fight “later in the year.” Commey will be defending against a quality opponent this summer. It’s anyone’s guess who DiBella will find for Commey to fight. With a good payday fight ahead against Lomachenko, it’s unlikely he’ll be matched against someone risky. Lomachenko might choose to fight again around the same time Commey makes his defense, especially if the two-time Olympic gold medalist easily beats Crolla on April 12. There’s no point in Lomachenko sitting inactive waiting to fight Commey later this year. Lomachenko will have a lot of interesting options to fight while he waits for a unification match against Commey later this year. It’s unlikely that Commey or Lomachenko will take on unbeaten Teofimo Lopez. He would be a really tough obstacle for either of those fighters to deal with. Lopez, 21, hits like a welterweight, and he’ll be a really tough obstacle for Lomachenko or Commey to deal with when/if the time comes to face him. As Lopez says, it’s the “Takeover.” He’s a future star, but he’s not going to wait on Lomachenko if he can’t get him to take the fight against him soon. Lopez plans on moving up in weight soon to light welterweight. Luckily for Commey, his ligament injury on his right hand didn’t require surgery after his quick 2nd round knockout win over Chaniev. Commey was able to heal by resting for the last two months.